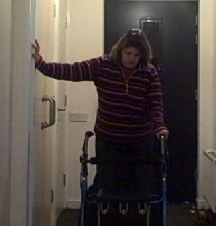 I thought I’d do a review of my TGA Active walker now I have had it a few weeks. 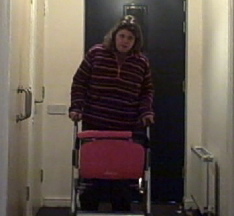 Firstly, my old one was a standard rollator with the fixed seat, even with the seat flipped up you could not walk within the frame which meant as I got more wobbly I was struggling with it. I have a wide gait to help balance me and my toes were always catching on the back wheels then if let go it would roll away. I often found myself using one arm to hold onto the wall. If you look very carefully at second pic under the pink cushion (of TGA walker) you can see my legs are within the frame. With the seat flipped up you can step forwards into the frame and remain more upright as you aren’t leaning forwards to try and avoid catching feet on back wheels. You could flip seat up from the sitting position in second pic and stand up with frame behind you, but then there’s nowhere to have the controller handy. In the pic with walker in front of me, you can see a little black bag attached via velcro (its a drinks bottle holder for a buggy!) it’s handy for putting wiimote in after you pressed the A button if its not then needed to do the exercise. For example the ski slalom on wii fit where you just have to lean from left to right once you have set off. I liked this walker because of the feature of been able to remove the basket (fits under seat) and flip seat up to get closer to worktops. It’s handy for a quick stand if you have to reach into a cupboard and easier than trying to reach over the fixed seat on the other walker. 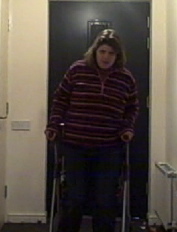 I also use it as a ‘reverse walker’ I find this helpful at night when I have no splints/boots on. I was not able to use the other one without extra support on legs as I was wobbling all over place. As its a tight fit it keeps me in a straighter line, the higher handles work better for me, my forearms aren’t as shaky from being extended in front of me (so I didn’t keep tripping on back wheels). They are also slightly shorter and don’t stick out as much if you wanted to sit and do a job you don’t have the handgrips stuck against the top of the worktop, meaning you have to lean more to reach a worktop. Strictly speaking its not intended as a reverse walker, but whereas before I had to have w/c at side of bed at night or sit on walker seat and push myself backwards to get to loo or into kitchen once splints where off. I have managed to walk the few steps with this one behind me enabling me to hold myself up within the frame and keep myself balanced even though my foot isn’t fully on the ground properly. 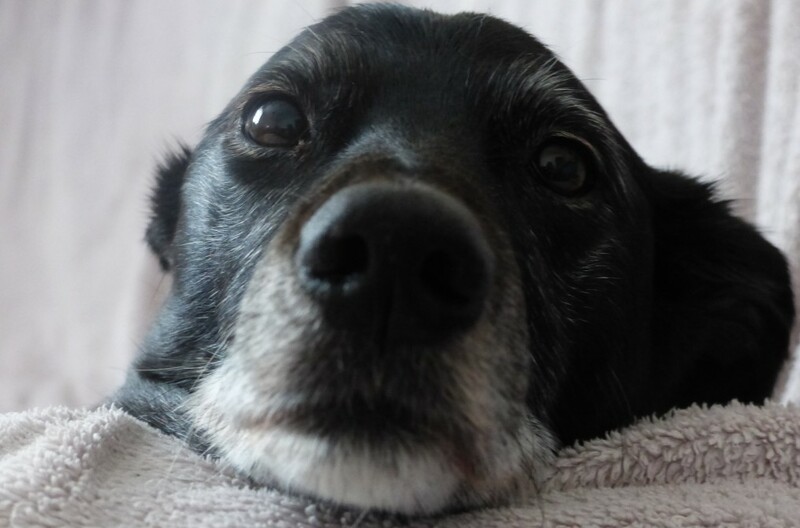 (I tend to walk on toes cos calf muscles are tight but feet floppier, I also tend to drag my toes along when don’t have splints/boots on) along with the rather jerky walk as I tend to try and shift weight quicker to get there before I fall over… its an odd kind of walk…. more like a duck desperate for a wee.. lol! The splints/boots do enable me to walk a bit better, my feet are in the right position to start and can manage either by hanging onto something or someone, walker or crutches so they do give me more options in tight spaces where a wheelchair/walker is too wide. I am pleased I got this walker, I wasn’t sure if I should go for a forearm walker as mentioned on a previous post, but I don’t want my brain to accept thats the only way I can walk just yet. It’s enough of a challenge as it is keeping enough mobility to remain independant, especially in an environment surrounded by large steep hills and no car! 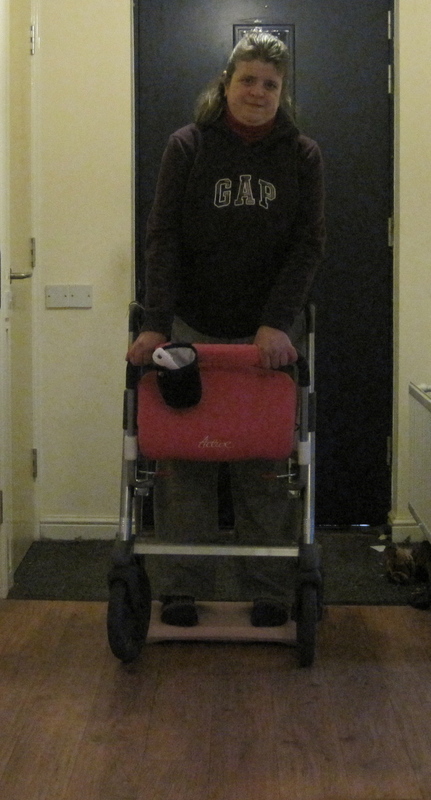 Getting out and about will always be challenging but hopefully this walker will at least give me independence around my own house and keep me able to do weight bearing exercises for a while yet. Weight bearing exercises are very important to independence, they are the difference between been able to get yourself up off floor even using sofas, beds or walkers to hang onto and pull yourself up. Been able to prop yourself up against a wall, worktop (corners work best) if you need a quick break or to turn yourself around, use your environment at your disposal but make sure whatever object you lean or pull yourself up with is solid and won’t fall on top of you! Core body strength is also important to been able to sit yourself up, getting dressed (even on the bed) as you shift from left to right to wrestle your jeans on! getting dressed in a wheelchair especially in a tiny dressing room is a good life skill to have and essential for shopping trips! My new years resolution is to still be at this level of independence by this time next year! !